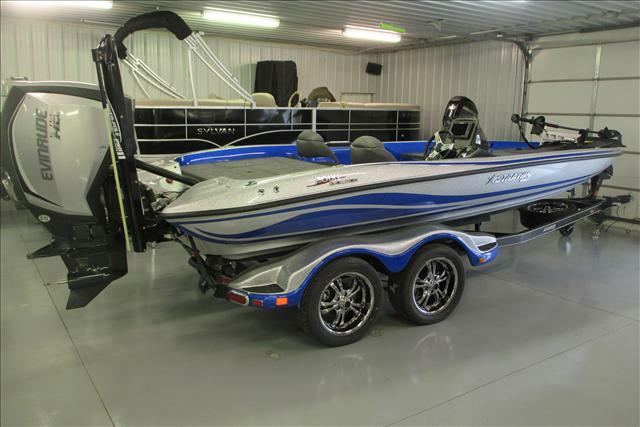 2016 Stratos bass boat 201 XL Evolution, Here is a 2016 Stratos 201 XL Evolution Bass Boat. The 201 XL Evolution is the Flagship of the Stratos bass boat line measuring in at 209 and with a beam of 96, his boat is built for serious tournament fishing. This rig comes with several upgrades including a Minn Kota Fortrex 112 trolling motor with US2 sonar built in, 7 keel guard, remote drain plug, G2 hot foot throttle, Atlas hydraulic jack plate, duel trim levers at the console, Lowrance HDS 9 Gen 3 fish finder flush mounted at the console, Minn Kota Precision 4 bank 60 amp charger, one 8 Power Pole Pro II black shallow water anchor, 17 Aluminum bullet wheel upgrade and a Stratos boat cover. The Stratos trailer is a channel beam steel frame with road armor protection and features a swing away tongue, tandem axle with fiberglass fenders and disc brakes on both axles. This boat is powered by an Evinrude G2 250 HO outboard. Please call us with any questions you may have about this rig at (937)-382-8701. 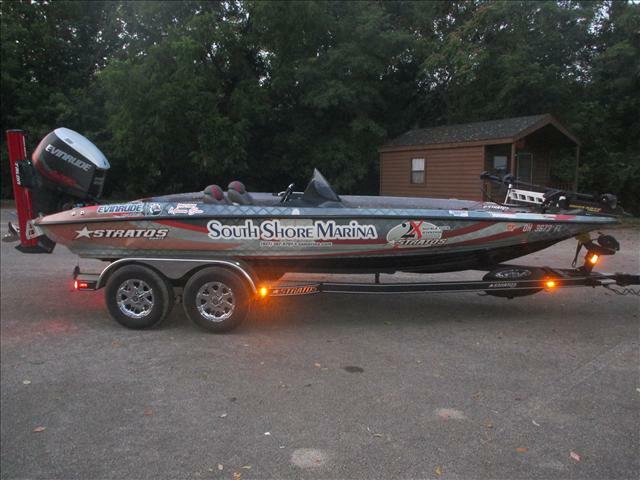 2015 Stratos Bass Boat 201 XL Evolution, Here is a 2015 Stratos 201 XL Evolution Bass Boat. The 201 XL Evolution is the Flagship of the Stratos bass boat line and this one is fully rigged for serious tournament fishing. This rig measures in at 20?9? and has a 96? beam and was used by our Bass Pro-Staff member for his tournaments for the year. This unit comes fully upgraded with a Minn Kota Fortrex 112lb trolling motor with US2, Hamby keel protector, Humminbird 1199 CI SI flush mounted at the console and a Humminbird 959 HD DI mounted on the bow, and the humminbird side image transducer. Boat also includes an 8? Hydraulic Jackplate, 3100 series deep cycle batteries and trays, Minn Kota 4 bank 60 amp precision charger, remote drain plug, 2 Minn Kota 10? red Talons and brackets, American racing wheels, spare tire with mount, hot foot throttle, HB SI Y cables, Ethernet cables w/adapters and cables/Ethernet equipment. This rig is powered by an Evinrude 250 hp HO outboard that has 30 hours of run time on it. . The finish on the boat was protected by a high grade 3M Tournament wrap, wrap will be removed. Please call us with any questions you may have about this tournament rig at (937)-382-8701.